National Cycle ATV WIndshields are made from tough Lexan® polycarbonate with a protective rubber trim edge for maximum durability in all types of terrain, conditions, and climates. Whether you ride for work or recreation, you can't beat the strength and quality of our windshields. * BAG#457 required for this application; 1-inch double U-clamps for ATV fairing. If you love the adventure of riding in extreme environments – the forest, the bush, and in cold weather – these ATV Windshields are for you. Made from tough Lexan® polycarbonate with a protective rubber trim edge for maximum durability in all types of terrain, conditions, and climates. It features sturdy, steel mounting brackets that are black epoxy powdercoated to take whatever abuse you can dish out. 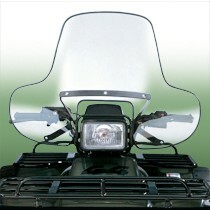 As well as a generous height and width, these windshields also incorporate integral hand guards. 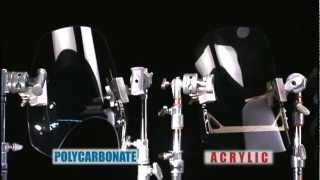 All National Cycle ATV Fairings and Windscreens are dimensionally formed, precision drilled, and computer routed for a smooth radiused edge and a perfect fit. ATV Fairings and Windscreens feature a beaded rubber edge applied to the outside perimeter to protect the finish when riding in rough terrain. Height is measured from top edge of fairing to top of screen. Width is measured in a straight line across the back of the screen at its widest point.